There’s a very good reason why my mantra will forever and always be “take time to think” in every part of life. The problem is that we live in too face-paced a world. Everything must be instant and it must happen now. Waiting is unacceptable and thinking is becoming a thing of the past. This past week, in the wake of video footage of Baltimore Ravens running back hitting his fiancé in a hotel elevator, the twitter hashtags #WhyILeft and #WhyIStayed have gained momentum as women share their stories of survival and courage on either feed. 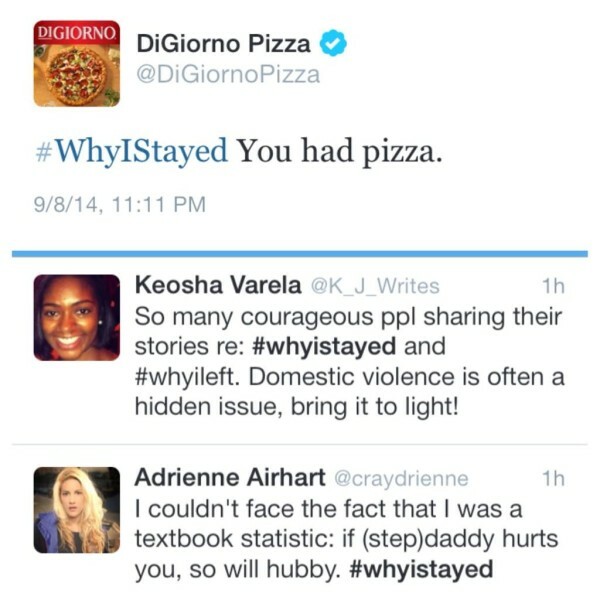 On Monday evening the often irreverent DiGiorno posted their own #WhyIStayed tweet, not fully understanding the conversation they were joining in on. It took the pizza conglomerate a full four minutes to realize their misstep and remove the offensive tweet but the damage to their brand was already done earning them strong backlash on Twitter and Facebook. While an apology was immediately issued the negative comments towards the company have continued. DiGiorno’s twitter feed has always been known for hashtag high jacking- making light or poking fun at trending topics the pop up on the site. 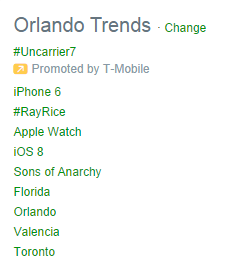 The best assumption that can be made for their community manager’s snafu is that the trend popped up on their feed (see the example from my personal trend feed) and they jumped on board making a joke. The lesson here is simple. Take the time to think. One simple click would have explained to the social media manager in question what the trend was all about and saved them from a world of hurt. The biggest take away from this entire situation is the same as so many others that I have written and talked about over the years- take time to think. Let this be a lesson to everyone is taking those few extra moments to slow down in life and think about the consequences of their actions. To really take the time to know what they are talking about before they open their mouths. I am refraining from offering any sort of personal commentary on either side of the argument in terms of the tweet and those it offended. I do want to say that I commend DiGiorno’s actions since the tweet took place. On both Facebook and Twitter they have taken the time to personally respond to each and every person that has reached out to the company. They are owning their mistake and working to correct it rather than bury it. I hope that we can all take a moment to learn from this! What are your thoughts on DiGiorno’s response to their tweet?